Huge news for Motts Run Reservoir Recreation Area! 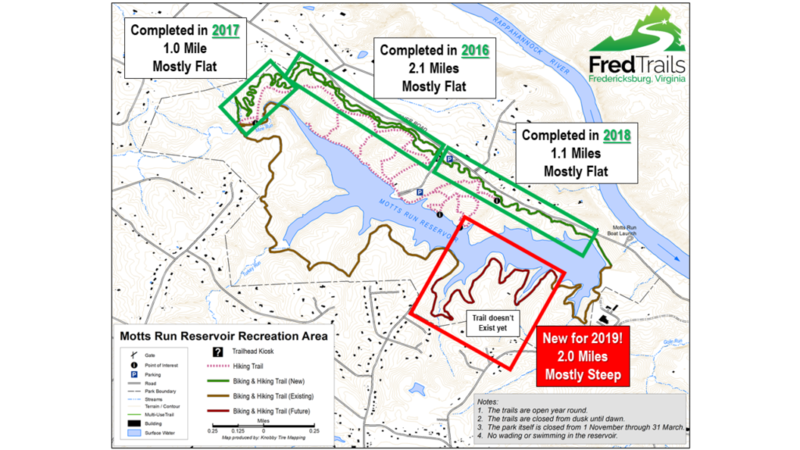 The Fredericksburg Government, Va and Fredericksburg Parks, Recreation & Events has approved the last 2 Miles of trail that officially closes the loop around the entirety of the Reservoir. Looking to build flow trail in 2019! Hoping to raise $20,000! As seen in the map graphic, using volunteer efforts, we have built 4.2 miles of trail over the past three years. Huge kudos to all the volunteer muscle who helped make those trails happen. Luckily, the terrain on the front side of Motts was mostly flat with limited steepness, which really helped with the amount of benching that was needed. The terrain within the last 2 miles is very steep and will require significant benching and grade reversals to create a self-draining trail while maintaining no more than a 7% grade. Because of this, FredTrails is working with a professional trail building company to install what will be our local equivalent to Fountainhead Regional Park…and who better to make this happen than the trail builder who worked on Fountainhead and other amazing trails around the state of Virginia. FredTrails has submitted several grant proposals over the past three months and we are hopeful to win some of these to work on the upgrade of the existing trails on the back side of Motts. Our goal is to have this reservoir loop open by Spring 2019 and to do this, we will need to bring in hired professional help. At $2.00 per linear foot, we are looking at $20,000 to make this happen and give us closure on the loop while giving us some very fun, flowy, and very scenic trail along the perimeter of the reservoir. FredTrails is committed to make this happen and will be doing the preliminary corridor opening to prep for the professional trail builder. We are hoping that the community of trail users will help us find these monetary resources through personal and business investment that will fund and fuel our outdoor recreational community. Please reach out to who you know and help us all get there!